To many football fans, the title of this campaign will have a familiar ring to it. Its root, the "Let's Kick Racism Out of Football" campaign, was established back in the early 90s to tackle the menace of racism towards black players in our national game. Back then, the Premier League was in its infancy, the Champions League a pipe dream and teams regularly played to dwindling crowds in decrepit stadia. Fast forward to 2010 and to unrecognisable developments. Players from across the globe clamour to be associated with English football’s top flight, clubs are no longer teams but "brands", and our version of the beautiful game is lauded widely and exported around the globe for billions of pounds. "Let’s Kick Racism…" is now known commonly as Kick It Out, football’s equality and inclusion campaign. It’s a softer message that reflects this change of landscape. The monkey chanting and banana throwing that blighted the game have now largely disappeared. However, problems remain. One of the game’s biggest conundrums is the complete absence of any openly gay footballers. There are over 2,000 professional players in this country, alone with thousands more worldwide. It’s a vast figure. Apply the law of averages to it and it would suggest gay professional players are plying their trade across the four divisions. In addition, there’s a worrying trend in the pervasiveness of homophobic chanting, aimed at both players and opposing supporters. Incidents involving Sol Campbell and Ashley Cole, as well as the regular taunting of Brighton and Hove Albion supporters – an area with one of the country’s largest gay communities – put this in sharp focus. Many fans don’t see it as homophobia, but merely as terrace banter. Lots of behind the scenes work has been done around the subject over the past few years. 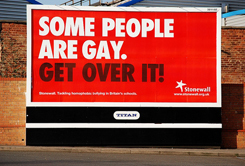 Apart from regular liaison with groups like Stonewall and Gay Football Supporters Network (GFSN), a Tackling Homophobia Group meets and monitors the subject regularly. Ongoing training and consultation takes place with referees and County FA’s on how to deal with incidents of homophobia at a grassroots level. In addition, Kick It Out’s Equality Standard is being adapted to include a section how clubs can engage with local gay communities. The FA is also working with safety officers at clubs to manage incidents more effectively. All sound work, but none high profile and much behind closed doors. We wanted something to give the subject a boost to get it into the consciousness of the football watching and non-football watching public. It was this climate that prompted the production of an awareness-raising film led by Kick It Out and supported by the FA and the PFA, the players’ union. "As an agency, Ogilvy Advertising's job is to change behaviour. That doesn't just mean getting people to buy a product, or use one service rather than another; it can also mean instigating social change. When we heard about the Kick It Out initiative we were struck by the importance of the issue and believed we could play a role. The brief was simple: Confront homophobia on football terraces, provoke a debate and challenge those who believe it is acceptable. The film was put into production in tandem with a full PR campaign. A key objective of the video was to bring the ordinarily taboo subject matter into the mainstream sports pages. A key element therefore was to get the buy-in from some of the major broadsheet and tabloid sports writers. Interviews were secured with BBC and commercial radio stations on both news and sports platforms. Flagship titles in the gay press were also targeted and social media played an important role, with the film being posted on Facebook and Twitter and spiralling from there onwards. The film generated an Advertising Value Equivalency figure of £340,000 over a three week period. To date it’s had almost 28,000 views on YouTube. Sewell continues: "We are all delighted with the outcome. It’s hard-hitting and places the viewer in an uncomfortable setting. It is in evoking these feelings that we can challenge people’s perceptions. The film won't change behaviour overnight but it has the power to highlight the issue and lay the foundations for a longer term strategy." Danny plans, manages and develops internal and external communications for English football's equality and inclusion campaign.